Give your students a hands-on connection to nature and science. 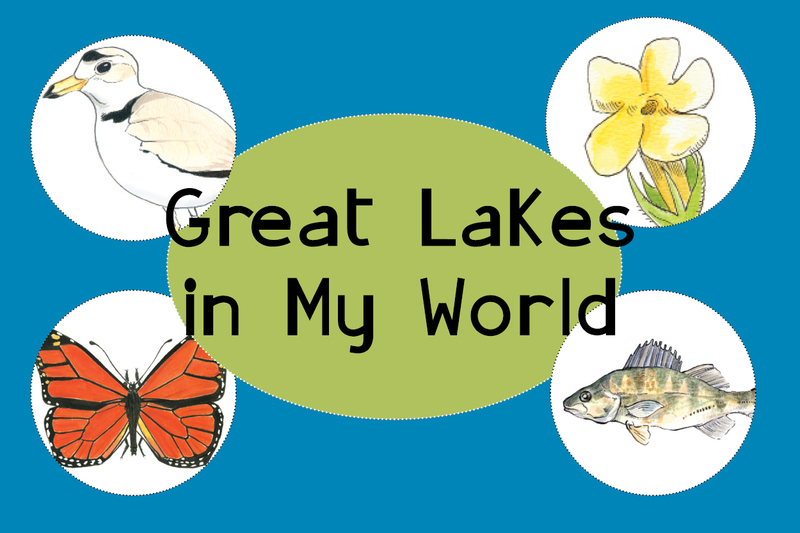 Great Lakes in My World offers indoor and outdoor activities you can integrate into your curriculum. Our elementary/middle school curriculum covers lakes, sand dunes, wetlands, human communities, history and geology. The curriculum kit includes: a 480-page book with 80 lesson plans, assessment rubrics, and student journal pages; a set of Creature Cards featuring 66 Great Lakes plants and animals; and a CD with additional resources. Cost: $50. Bulk discounts are available. See a sample activity: Living Life Cycles. Our high school curriculum focuses on Great Lakes coastal habitats. The curriculum kit includes: a USB drive containing PDFs of a 169-page book with 17 lesson plans, assessment rubrics, student journal pages, and additional resources; plus a set of Creature Cards featuring 66 Great Lakes plants and animals. Cost: $25. Bulk discounts are available. See a sample activity: Coastal Habitat Research. Creature Cards featuring 66 Great Lakes plants and animals. Cost: $15. Bulk discounts are available. Great Lakes in My World activities align with Next Generation Science and Common Core standards. K-8 activities also address state standards in Illinois, Indiana, Michigan, Minnesota, New York, Ohio, Pennsylvania and Wisconsin. See standards alignment. Questions? Email our education department. Bring the Great Lakes into your classroom! Order the K-8 or 9-12 curriculum (K-8: $50, 9-12: $25).